photo courtesy of Nowodworski Fdtn. Westchester’s cultural organizations grow and support individual artists in the creation of new work. Museums and galleries present exhibitions of regional significance. Concerts feature musicians of the first rank. Conservatories provide need-based financial aid, making instruction more accessible. Community choruses, theaters, and orchestras give hundreds of people the chance to perform. Local arts councils custom-fit programs for their communities. Artists explore and share their personal visions. ArtsWestchester offers grants in several categories, although funding may not be available in each category every year. ArtsAlive Grants are made possible with funds from the Decentralization Program (DEC), a regrant program of the New York State Council on the Arts with the support of Governor Andrew Cuomo and the NYS Legislature and administered by ArtsWestchester. 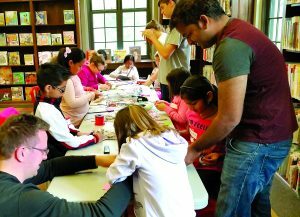 Basic Program Support, Project Support, Mount Vernon Arts Initiative, Arts for People with Special Needs, and Yonkers Arts Initiative are made possible with support of Westchester County. ArtsWestchester accepts applications through an electronic portal, Submittable. Sample guidelines and applications are also available on our website. We encourage you to review the guidelines thoroughly before entering information into the application form. We also suggest that you write answers to the application in Word, then cut and paste into the application form.